OWM: Ostomy, Wound Management, December 2018, Special to OWM: The Relationship of Diabetes to Bladder and Bowel Dysfunction, By Nancy A. Faller, RN, MSN, PhD, CWOCN; Elizabeth A. LaGro, MLIS. Read the article. OWM: Ostomy, Wound Management, November 2018, Special to OWM: Why Continence Care: The Importance of Including Continence Care in Your Wound Care Practice, By Nancy A. Faller, RN, MSN, PhD, CWOCN; Elizabeth A. LaGro, MLIS. Read the article. OWM: Ostomy, Wound Management. July 2017, Special to OWM. Innovation in Products for People with Incontinence, By Elizabeth A. LaGro, MLIS. Read the article. Stigma and Health Conditions. Part 3, by Cheryle Gartley with Mary Radtke Klein (PDF), part two of a series on the inapct of stigma on people with health conditions and the inmportance of resilience This article is published in the December 2015 edition of EP Magazine. Subscriptions and access to the complete issue and journal are available at www.eparent.com. Read the article. Stigma and Health Conditions. Part 2, by Cheryle Gartley with Mary Radtke Klein (PDF), part two of a series on the inapct of stigma on people with health conditions and the inmportance of resilience This article is published in the December 2015 edition of EP Magazine. Subscriptions and access to the complete issue and journal are available at www.eparent.com. Read the article. Stigma and Health Conditions, Part 1, by Cheryle Gartley with Mary Radtke Klein (PDF), an article on the impact of stigma on people with health conditions and the importance of resilience. This article is published in the November 2015 edition of EP Magazine (Exceptional Parent). Subscriptions and access to this journal are available at www.eparent.com. Read the article. A quality of life survey of individuals with urinary incontinence who visit a self-help website: implications for those seeking healthcare information, by Rozensky RH, Tovian SM, Gartley CB, Nichols TR, Layton M. Read the abstract. Rick Rader, MD, after attending the 2011 Innovating for Continence Conference, wrote an editorial for the May 2011 issue of Exceptional Parent, entitled “Wet Pants” that included his thoughts on the conference. Access the article. 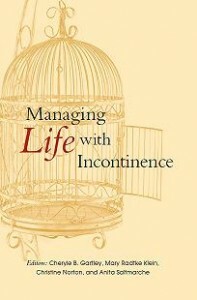 Bringing Mohammed to the mountain: educating the community for continence, by Cheryl B. Gartley. Read the abstract. The Foundation’s President and Founder, Cheryl Gartley, was featured in The Lancet with her article on living with incontinence and dealing with stigma. Read the article. The Us Too Prostate Cancer Education and Support Group published Coping with the Feelings Surrounding Incontinence by Cheryle Gartley. Read the article. The problem of urinary incontinence and the future prospect viewed by patients–activities by the Simon Foundation of the United States, by Cheryl B. Gartley. The original article is in Japanese.